Spread with cream cheese. Top with tomatoes, oregano and basil. Sprinkle with cheeses. Bake an additional 10 to 12 minutes or until cheese is melted and crust is golden brown. Use 1 1/4 cups shredded provolone cheese (5 ounces) instead of the mozzarella and Cheddar cheeses. 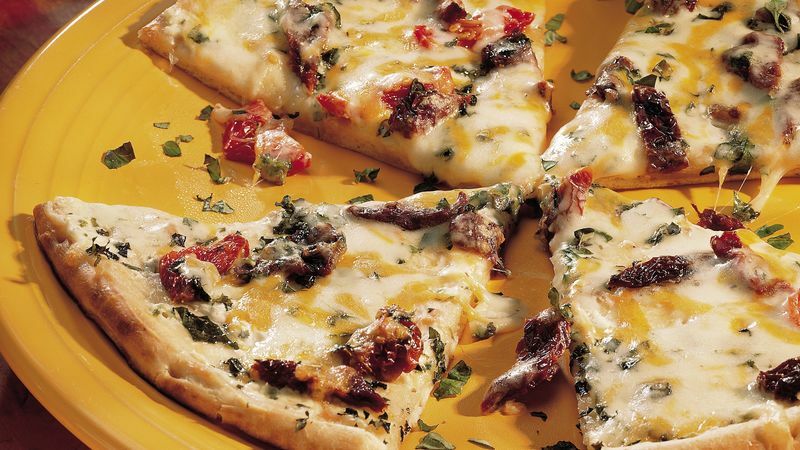 Provolone cheese has a slightly rich, smoky flavor that would be delicious on this pizza. Add 1/2 cup thinly sliced mushrooms to the pizza when topping with the tomatoes. Or for the meat lovers in your family, add small amounts of chopped pepperoni to part of the pizza.